Support for wind energy is project specific. For example the Project for Large Scale Development of Renewable Energy (PERGE) provides a specific mechanism to support wind energy in Mexico. This project receives financial contribution from the Global Environmental Facility (GEF) and the World Bank of 20 million €, which allows the state-owned utility Comisión Federal de Electricidad (CFE) to provide an incentive for the development of the project La Venta III. The incentive consists of 0.73 €-cent per kWh delivered to the grid in a 5-year period counting from the start of the project. CFE will buy electricity for 25 years at a price of 0.03 €/kWh. In addition, a national wind resource map will be developed. Under the PERGE scheme CFE awarded the Spanish enterprise Iberdrola Renovables the construction contract for La Venta III wind farm in March 2009, following an international public tender. Iberdrola will supply energy to the CFE for the next 20 years. La Venta III wind farm is going to be situated in the municipality of Santo Domingo Ingenio in Oaxaca State and will have an installed capacity of 102.85 MW. The construction started in 2009; the project was expected to be operational in May 2011. Currently no other projects are expected to receive financial incentive under the PERGE scheme. Another possible framework for wind energy projects is the Independent Power Producer (IPP) scheme: Under this scheme private producers with plants over 30 MW (regardless of the technology) must sell their power to the CFE through long-term Power Purchase Agreements (PPA), which are awarded through competitive bidding. Usually these contracts last for 20 years and the project should be included in the planning programmes of CFE (currently small power producers (<30 MW) do not need to be considered in the expansion plans). A similar scheme for small power producers (< 30 MW) is planned to be established. Under the IPP scheme, CFE plans to tender 600 MW of wind projects during 2008 to 2014 in 100 MW increments. The Power Purchase Agreements (PPA) includes a fixed capacity charge, a fixed operation and maintenance charge and a variable energy charge based on fuel prices. Within the IPP scheme and without extra financial incentive, CFE also signed a 150 million € contract with the local consortium Energias Ambientales de Oaxaca for the construction of the 101 MW Oaxaca I wind farm which is expected to be operational in 2011. To facilitate the connection of wind parks to the national grid, México started the implementation of the "Open Season" project (Temporada Abierta) in 2006. The project consists of an agreement between CFE and the private developers to distribute the costs between CFE and private developers that occurred due to the new transmission infrastructure built in the state of Oaxaca (20 % CFE and 80 % private developers). The Open Season was organized in three steps according to the required specifications of the grid to connect the wind parks. The First Season (mini season) reinforced an existing 115 kV grid by adding a second circuit. Two wind parks that started operations in 2009 are served by this scheme (Parques Ecológicos de México and Eurus). The Second Season consists of four wind parks that were to start operation by 2009 and 2010 and are connected to a new 115 kV transmission line. The Third Season consists of the construction of a new transmission line of 400 kV by CFE with involvement and guarantees of the project developers. It should facilitate the access of six new projects and will increase the connection capacity for two existing projects. It was expected that the new transmission line would be be in operation by September 2010. Besides the 590 km circuit of new or reinforced transmission lines, the plan includes the construction of a new power substation and the upgrade of three existing ones. For new wind parks, a New Season project is going to be the instrument to expand the transmission grid in the future. certain areas in the states of Zacatecas, Hidalgo, Veracruz, Sinaloa and in the Yucatán Peninsula. Based on estimations of the Mexican Wind Energy Association (AMDEE)there is a feasible potential to install 10 GW of wind capacity. However the US National Renewable Energy Laboratory (NREL) estimated that just in Oaxaca there is potential for 33 GW that can be installed in an area of 6 637 km2. The potential can differ depending on the selection of wind locations, the accessibility to transmission capacity and the type of wind resource considered. 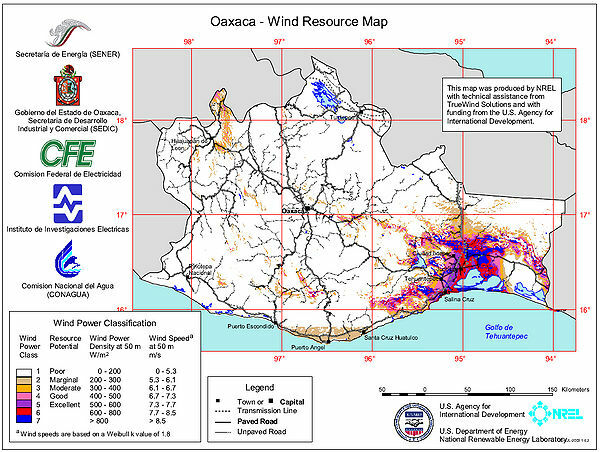 The Oaxaca Wind Resource Atlas, produced in 2003 by the NREL wind resource group, is the most extensive mapping study for Mexico. The detailed wind resource maps (at 30 and 50 m height) and other information contained in the atlas facilitate the identification of prospective areas for use of wind energy technologies, both for utility-scale power generation and off-grid wind energy applications. According to NREL, the wind-mapping results for Oaxaca show many areas that are estimated to have good-to excellent wind resources (wind power Classes 4 to 7, with 7 being the highest). Wind power class 4 correspond to wind speeds between 6.7 – 7.3 m/s and wind power density between 400-500 W/m2. Wind power class 7 correspond to wind speeds bigger than 8.5 m/s and power densities bigger than 800 W/m2. In addition to NREL’s atlas, available maps for other regions of Mexico have been produced by private companies like TrueWind SL (high resolution wind resource atlas for Jalisco State) and 3tierGroup, which unfortunately can't be accessed for free. By end 2010 projects in operation amounted to 519 MW. The project pipeline in Mexico is expected to reach around 4 000 MW before 2012. Out of this, 2 564 MW correspond to already committed projects, which are presented in the following table. Finally, most of the projects will be commissioned under the self-supply modality. This modality is attractive to project developers because of the high electricity prices for large users charged by CFE. In addition to the projects committed for construction, a number of potential projects with a combined installed capacity of 1,450 MW is presented in table 7. These projects will be developed mainly for export to the US market. Mexico is open to foreign direct investment (FDI)n most economic sectors and has consistently been one of the largest recipients of FDI among emerging markets. In addition, Mexico has signed 12 free trade agreements covering 44 countries. This is a good indicator for a favourable investment climate providing legal security for the investors. Intellectual property rights are guaranteed by a variety of international agreements that Mexico has signed. For example, Mexico is a signatory of the Paris Convention, the Patent Cooperation Treaty and the International Union for the Protection of New Varieties of Plants (UPOV). The authority in charge of enforcing the law and the treaties is the Mexican Institute for Industrial Property (IMPI). Mexico is strategically located next to the growing wind market of the US. Because of the proximity to this big market, companies based in Mexico are starting to offer products and services for the wind industry. High skilled local workforce in the electricity, automotive, aeronautic and civil engineering sectors can be easily trained in the manufacturing of wind power equipment. Regarding research and development, the Instituto deInvestigaciones Electricas (IIE) has established the Centro Regional de Tecnologica – CERTE (Regional Centre for Wind Technology). The Centre will focus on further investigating the wind power potential in Mexico. The Centre will also certify wind turbines. In addition, the CERTE will design and test a locally produced wind turbine that is expected to be produced at industrial scale in the country. Furthermore, the Engineering Institute of UNAM (Mexico National University) is carrying out research on the use of wind technologies for water desalination. However, the wind power sector in Mexico faces some challenges. It is acknowledged that despite the big potential, wind development in Mexico has been slow. This is based on the fact that the first permit for wind projects was issued by CRE in 1998 but it was only in 2007 when the first large scale project became operational. Reasons for this delay are the lack of financial incentives from the government and the slow process to expand the grid to areas with wind potential. It is expected that the recent reforms of the regulatory framework (2008) encourage sustained development of the wind industry. Furthermore, there is a limited supply and availability of equipment and services (both at the international and local level). Despite the Open Season scheme, restrictions persist due to the fact that there are long distances between the potential wind projects sites and the connection points to the transmission grid. Communities living next to the projects have complained that the project developers are not fulfilling their commitments on payments and compensations related to the rental of their lands, which is partially caused by delays in the project implementation. Finally, the global financial crisis has dried up commercial bank financing for private wind deals and the Mexican projects have had problems securing financing to be completed. This page was last modified on 27 October 2014, at 17:16.